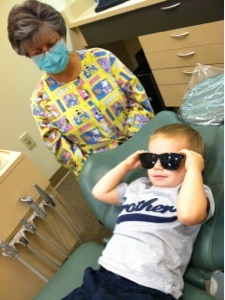 I took Jax to the dentist last week. 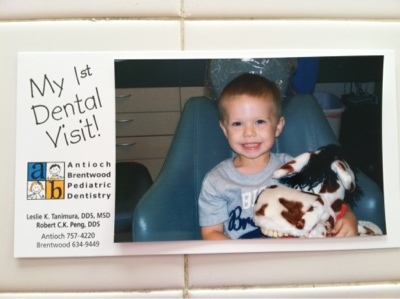 He had been twice in North Carolina, but this was his first time at his new dentist here. They were so great with him and he did SO well. They kept saying how they couldn't believe that he was following directions so well and sitting so still at only 3 years old. 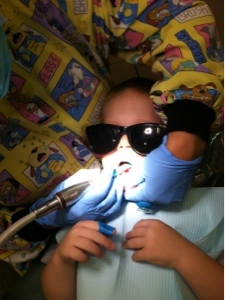 At our previous dentist, he had a weak-enameled tooth filled and drilled. 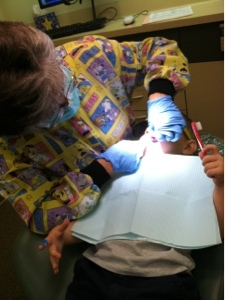 He also has a molar that is really rough on the outside that we brush extra well. But the dentist said that his teeth looks perfect right now and that the rough tooth isn't causing any problems at this point! I hope he smiles that well for school pictures tomorrow! Oh my gosh, that is so cute! 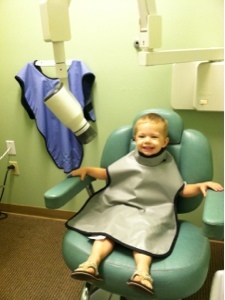 I can't believe he sat still for the x-rays too! 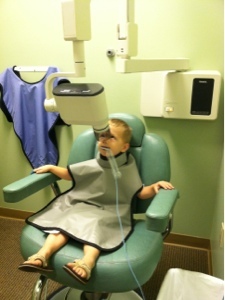 I'm a hygienist, and most of the three year olds (or even six year olds to be honest) have a really hard time with X-rays. Good job Jax!